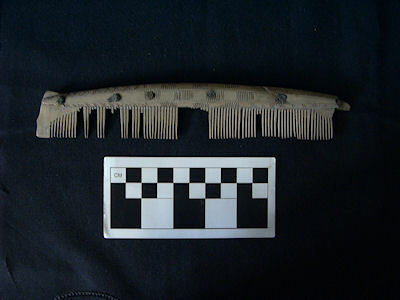 As an aid to understanding chronology, economics, identity and culture contact, the early medieval bone/antler hair-comb is an under-exploited resource, despite the existence of an extensive literature borne out of a long-standing tradition of empirical research. Such research has been undertaken according to diverse traditions, is scattered amongst site reports and grey literature, regional, national, and international journals, and is published in a number of different languages. The present article provides a general synthesis of this data, together with the author's personal research, situated within a broad view of chronology and geography. It presents the author's classification of early medieval composite combs, and applies this in a review of comb typology in space and time. It makes use of recently excavated material from little-known and unpublished sites, as well as the classic studies of familiar towns and 'emporia'. The atlas is intended for use as a reference piece that may be accessed according to need, and read in a non-linear fashion. Thus, it may act as a first port-of-call for scholars researching the material culture of a particular spatio-temporal context, while simultaneously facilitating rapid characterisation of freshly excavated finds material. It should provide a useful complement to recent and ongoing question-oriented research on combs. This article is Open Access, made possible by the generous support of the Departmental Research Committee, Department of Archaeology, University of York.